The cyclist is heading in one direction and a car is heading the opposite direction. 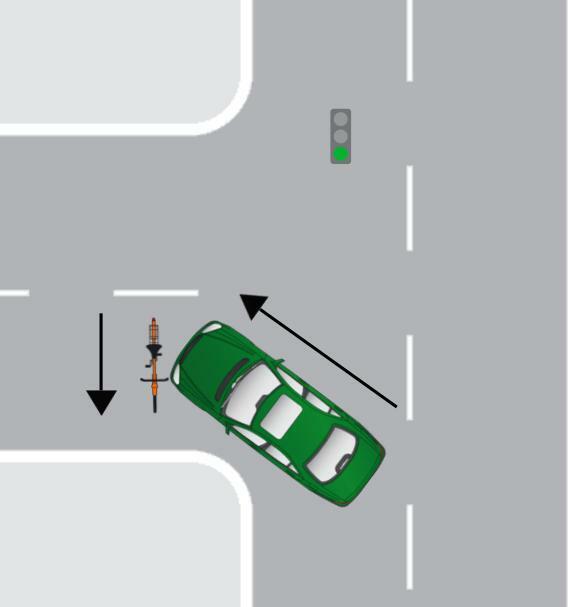 The car makes a left hand turn directly in front of the bike either hitting the cyclist or causing the cyclist to slam into the car. Make sure you can be seen: Wear bright clothing and make sure you have a headlight. This accident is usually due to the inattention of the driver of the car. The cyclist would clearly have the right-of-way and the car just was not expecting or did not see the cyclist. While the cyclist has the right-of-way, it is still up to a jury or judge to make the ultimate decision of liability if the two parties cannot resolve the matter on their own.